When you play in a professional league such as the National Basketball Association, you aren’t merely attempting to put your stamp on the present, but you are also trying to create a lasting legacy. There are some unbelievable players in the league today. But there have been some great players to have come before them. How does Steph Curry stack up to the MVP’s of yore? What will LeBron James’s place in history be? These are some questions that we can’t help but ask; even as the league itself is constantly changing. As much as we’d like to compare the current game to that of the past, we have to take into consideration that we’re living in a different era. It’s not just about the new players and organizations. It’s about the style of play, the changes in rules, and market we live in. With all these factors in play, it can, often times, feel impossible to line the past and present up side by side. However, there is one area that has changed over time that we should have no problem comparing: jerseys. Some folks prefer an updated and modern look. Others can’t help but be prone to an old school, retro feel. Regardless of your overall taste, there can be no denying that some of the past gear was super cool. With that in mind, we’d like to pay a little tribute to the past. 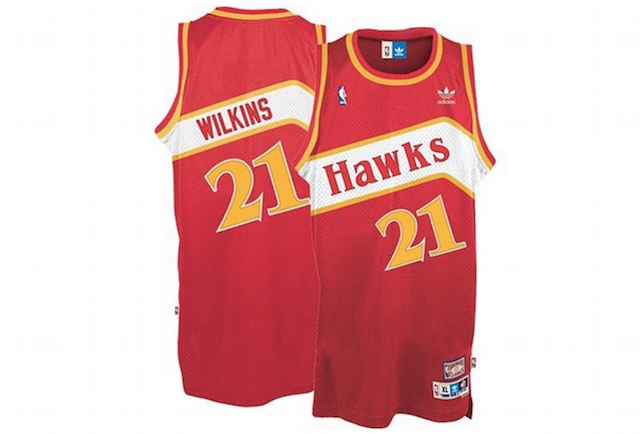 In our opinion, here are the five best NBA throwback jerseys ever. By finishing the 2014-15 regular season with a 60-22 record — good for first place in the Eastern Conference — the Atlanta Hawks certainly exceeded expectations. And while this group may have fallen short in the postseason, it showed how to be a “team” in the truest sense of the word, and that should be commended. Another thing we dig about this current unit — and ownership — is a willingness to embrace the past; specifically through the acceptance of the totally awesome “Pac-Man logo.” However, if this group really wanted to step up its game, it would pay homage to Hawks’ throwback gear. It’s not that the current jerseys are terrible, it’s that they feel too rigid. We’re not a big fan of the “all caps” lettering, and the numbers look comical. And don’t get us started on the coloring — its too toned down for our taste. However, these vintage tops are completely fresh. We love the upward diagonal lettering and numbering, the flow of the line work, and how the colors complement each other, while at the same time exuding a perfect contrast. You don’t need a flashy player like Dominique Wilkins around to really make them pop, and if you ask us, there’s simply no good reason to keep these uniforms in the past. You can order one here. In hiring Scott Skiles as their new head coach, the Orlando Magic are hoping that a familiar face is the right fit to lead this team into the future. It will be some time before we see whether or not this was the right decision. And yet, if this franchise was looking to draw from its past as a means of forging a positive future, it would be wise to bring back the vintage uniforms. That’s when this team was really magic. There are many things that could be fixed with today’s Orlando gear — that atrocious neckline would be a good place to start — but this is all about how cool the throwbacks were. The font used for the numbers is sweet, and it really pops on account of the white outline. We love the straight lines throughout the whole jerseys and like how there is minimal space between each vertical stripe. 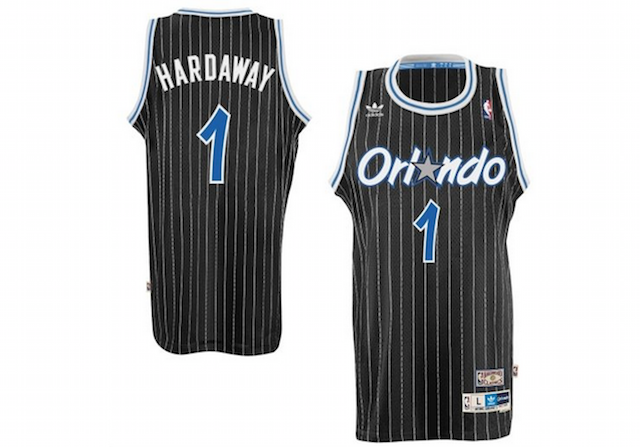 Yet, it’s the “Orlando” on the front that really makes this jersey stand out. By using a beautiful slanted font — white with a blue frame — this really feels like there’s a magical element to it. However, the real genius was using a star in place of the “A” in “Orlando.” Our eyes can’t help but be drawn to it. And really, isn’t that the point? The throwbacks are available here. 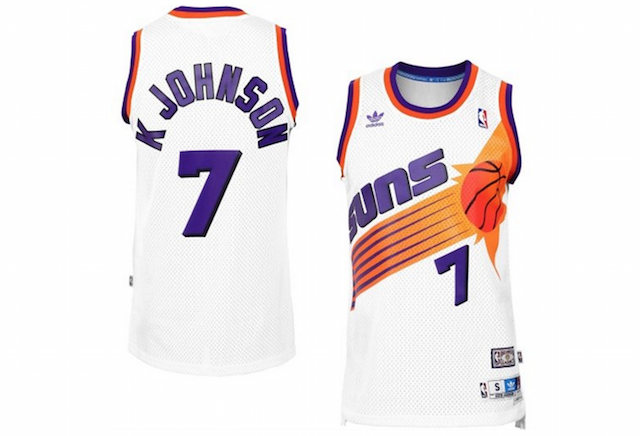 Some folks are fans of the retro Phoenix Suns jerseys and others simply don’t get it. As you can see, we fall in the former category. Today’s uniforms are certainly more current, but they lack the pizzazz of Phoenix’s swag of yore. We don’t particularly like use of the V-neck, and we can’t stand the accented look of the shoulders. But what really frustrates us, is the half-streak right before the numbering. If you compare this to the past tops, it’s no contest. The throwbacks are in a league of their own. We are all about the Sun. We enjoyed when this franchise made that symbol a focal point of its uniforms. By turning the basketball into the star that stands at the center of everything, Phoenix was making a strong point. This organization is, and always will be, about basketball. Perhaps we’re waxing poetic a bit too much here, but we can’t help it. And if the Sun doesn’t work for you, then we hope you at least appreciate the orange and purple around the neck and sleeveless sections. That’s some crisp use of color, and you can add it to your wardrobe by ordering a jersey here. The modern day Philadelphia 76ers don’t perform at the same level as teams of the past, but at least this franchise seems to have an idea on how to reinvent its identity. And while this group accepts losing as a means of eventually finding success, it has looked to the past to fix one significant faux pas: its jersey. 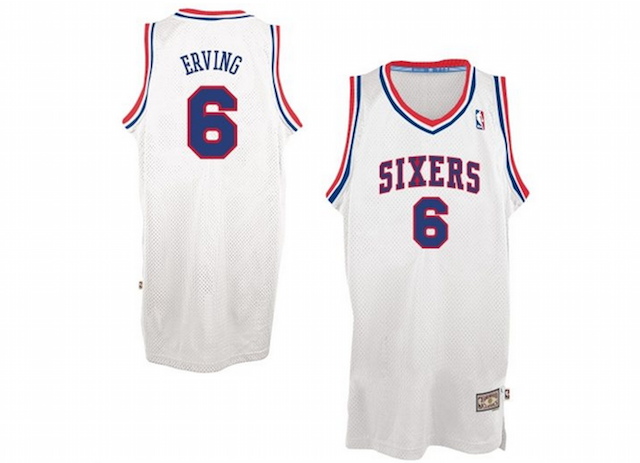 The current Sixers top does feel a bit “boxey.” But what we find so appealing is the simplicity of the present look. There’s no need to go over the top with the design. Philadelphia is drawing attention to the bold use of red, white, and blue, and we think that’s a smart move. Of course, if it were up to us, we’d try and resemble the throwback a bit more. These jerseys really took to heart the notion that “less is more.” And it absolutely works. We usually don’t like the V-neck as much, but because the Sixers are using a deep-V, we can let it slide. This jersey — and its red counterpart — are beautifully simplistic. The letters and numbering are extremely minimalist, and yet, the red outlines are a graceful touch. We think the three stripes surrounding the neck and sleeveless areas are a smart choose and provide an extra element to this top. When we look at this jersey, we can’t help but be transported to a time when the focus was merely on the game itself. And if that doesn’t get you sentimental, perhaps this will. That’s right. The Doctor is in. 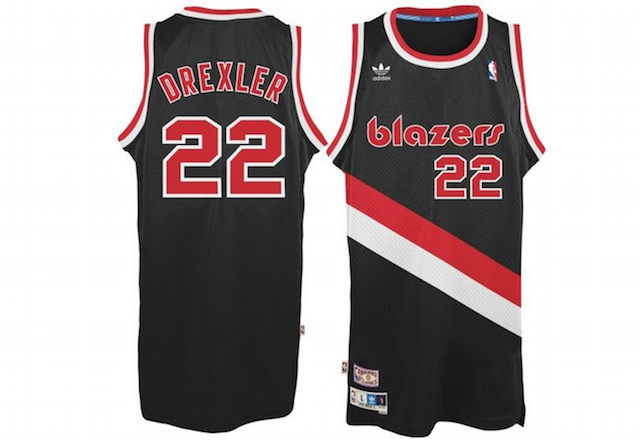 The Portland Trail Blazers, in our opinion, have set the standard for top-notch uniforms. Even today, this organization has remained fairly true to the gear of yesteryear. And if we’re being completely honest, this franchise has the coolest-looking Christmas Day uniforms in the entire NBA. Yet, even with all the quality gear this team has, we completely miss Portland’s older jerseys. Those throwbacks were fantastic. The accented white area around the neckline (and sleeveless section) immediately draws you in and force you to take notice of the whole top. That’s a good thing because this jersey is worth paying attention to. Not only is the red numbering and lettering a glorious choice, but absolutely LOVE how the “blazers” name is entirely lower case. If there was nothing else to focus on but the lower-cased bold print, it would still be enough. Sometimes organizations simply get it. It’s clear the Portland Trail Blazers are among the selective few. Snag a Portland throwback jersey here, or look at some of the other great NBA throwback jerseys here.